There were two kinds of moms in the '70s. One let you buy whatever cereal you wanted (also known as: my mom!). Others tried (often fighting a losing battle) to get you to eat healthier cereal, and there weren't a lot of choices back then. Kix, maybe. Or even Life. I get the impression that my mom was sold by the King Vitaman name into thinking it as somehow healthier for us, but because it had a dressed-up character on the box, she figured we'd go for it. The cereal came along in 1970 and yes, it's still being made today. Jay Ward (Rocky and Bulwinkle!) created the mascot, and according to Wikipedia, ex-vaudevillian George Mann was the jolly looking king on the box. He died in 1977 but lived on via the box photo until he was replaced by an animated king in 2000. I remember it being kind of Cap'n Crunchy, and the shapes were little crowns. One online commenter says that in the 1980s, the company took half the sugar out and the cereal lost its appeal, but I can't vouch for that. It was never my favorite cereal, but when it was all mom would buy, it did fine. Was it a part of your breakfast routine? 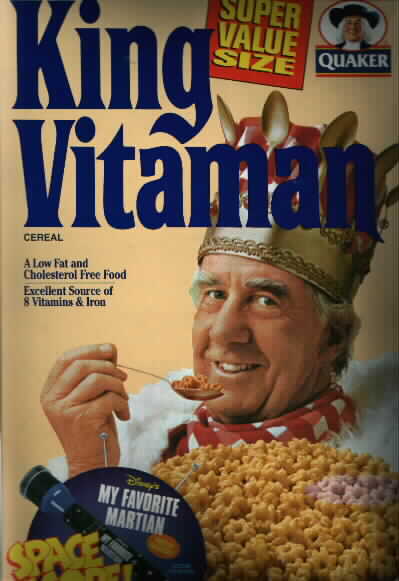 I LOVED King Vitamin! To me it was pretty much the same stuff as Quisp and Capt'n Crunch, but my parents never had a problem buying it for me, I think because it had the word "vitamin" in the name (well played, Quaker!) They also had good toys in the boxes, as I recall. It seemed to disappear sometime in the '70s, then I seem to recall getting some for my daughter sometime in the early '90s. At our house, it was ONLY the "grown-up" cereals. It wasn't until my sister and I went to camp that we got to taste the "kids" cereals. I recall not being impressed by them.